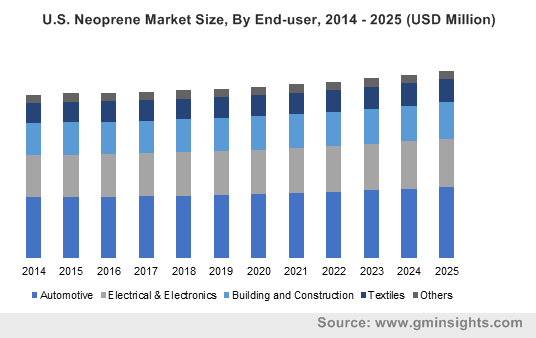 Neoprene Market size was over USD 1.95 billion in 2018 and will witness 2.3% CAGR during the forecast timespan. Rapid growth in the building & construction industry especially in Asia Pacific and the Middle East is likely to propel neoprene demand through the forecast period. The growing government participation in private and public infrastructure development in Asia Pacific nations is one of the key factors attributing to the growing product demand. Neoprene exhibits properties such as excellent weather and ozone resistance coupled with enhanced tensile strength, which makes them suitable for its use in window seals, window gaskets, bridge seals, bearing pads and elevator astragals, etc. The growing application of neoprene in automobile industry is also anticipated to substantially contribute to product demand during the assessment period. It is widely used in the automotive industry, owing to its thermal resistance, tensile strength and durability. Neoprene rubber is highly employed in hose covers, CVJ boots, power transmission belts, vibration mounts, shock absorber seals and steering system components. For instance, the overall automobile production in 2014 was close to 70 million units and surpassed 97 million in 2018, such escalation in automobile sales and manufacturing will subsequently boost neoprene market size by 2025. However, the prevalence of substitutes to neoprene along with the volatility in crude oil prices are projected to be some of the major downside to neoprene demand in the coming years. Neoprene is a synthetic rubber which is manufactured from petroleum feedstock. Therefore, the price volatility of crude oil can negatively affect the market during the review period. Furthermore, the presence of suitable alternatives such as silicone rubber can also act as restraining factor to neoprene market size growth over the forecast timeframe. Product demand in construction and automotive sector in North America and Europe is poised to exhibit moderate growth rate whereas countries in Asia Pacific shall hold a largest share in the automotive and construction sector on account of improvement in economic conditions, availability of resources and developing industrial base. 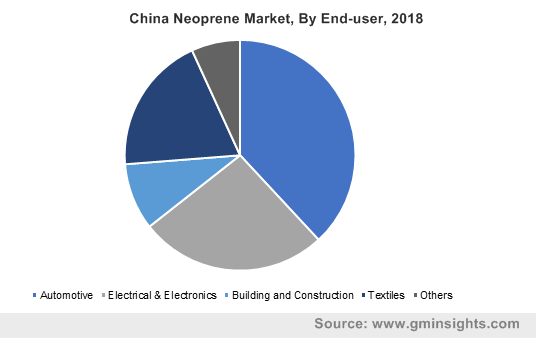 Additionally, the growing penetration of neoprene in the electrical and aquatic sports gear industries in Asia Pacific nations will further augment product demand during the review period. Neoprene rubber sheet market was the largest product segment in 2018 and is anticipated to follow the same trend during the forecast years. The product offers excellent properties such as low compression set, excellent resilience and abrasion resistance and advanced resistance to ultraviolet and ozone radiations. These properties make them ideal for their use in seals, gaskets, building insulations and liners in the automotive, electrical and construction industries. Neoprene latex segment is likely to be the second largest segment during the assessment period in terms of volume and value. These latex products are widely used in manufacturing gloves and adhesives which, in turn, are used in automotive, building & construction and electrical & electronics industry. Neoprene market for automotive shall witness maximum gains over the forecast timespan. The rising demand for automobile in Asia Pacific and the Middle East has led to a burgeoning rise in product demand in the automobile sector. Moreover, growing construction business in parts of Middle East is also expected to positively impact product demand in the coming years. Furthermore, the increasing adoption of neoprene foam in the aquatic sports gear shall propel neoprene market size growth over the forecast timespan. Asia Pacific accounted for the largest share in global neoprene market, both in terms of value and volume. Neoprene manufactured in Asia Pacific are supplied through a vast distribution mode such as retailers, wholesalers and online portals. Latin America is likely to be one of the fastest growing regions in global neoprene market. This can be attributed by the rapidly growing automobile sector in Brazil and Mexico. 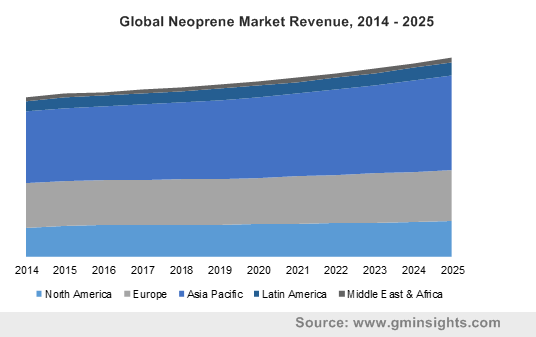 In addition, the Middle East is also expected to be a major revenue pocket for the neoprene market during the forecast period. The burgeoning construction sector is expected to bring about a major growth for neoprene industry in near future. 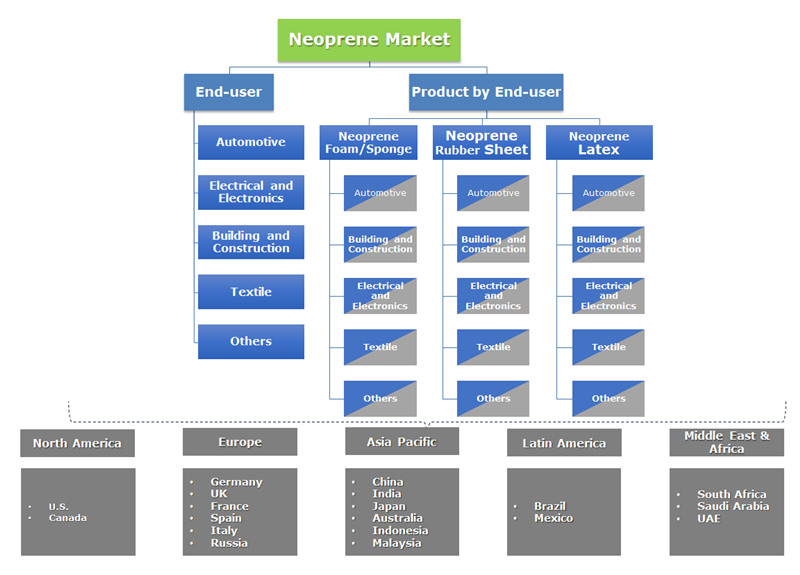 Neoprene market is a fragmented market with only seven major companies holding a significant market share. The proficient market contributors are Denka Company limited, Lanxess, Tosoh Corporation, and Shanxi Synthetic Rubber Group Co Ltd among others. Among the aforementioned companies Denka holds a market share of over 25% followed by Lanxess, and Tosoh Corporation. The industry depicts huge degree of integration of manufacturers. For instance, Tosoh and Denka have their own distribution channel across the globe. This is a major strategy adopted by these companies to retain their market presence while catering to the growing product demand. Other major manufacturers include, Sundow Polymers Co., Ltd, Covestro AG, Zenith Rubber, BGK GmbH Endlosband, Pidilite Industries, The 3M Company, and TuHuang Chemical Co.
Neoprene are a class of synthetic rubbers that exhibit good chemical stability and maintains its flexibility over wide range of temperatures. Neoprene are available in the market in solid form as sheets and foams and in latex form. Neoprene sheet are mostly commonly used product type that are employed in the electronics, automotive and the construction industry. Neoprene foam is also widely accepted in the form of aquatic gears owing to its excellent insulation properties. Some of the niche applications of neoprene includes hammer tips in electronic pianos, masks and others.